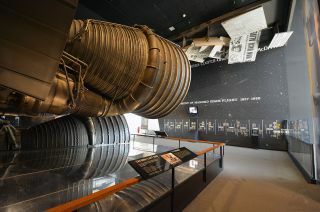 The one and a quarter F-1 engine display at the entrance to the "Apollo to the Moon" gallery at the Smithsonian’s National Air and Space Museum in Washington, DC used mirrors to create the appearance of there being five engines as was at the base of a Saturn V rocket. For more than 40 years, the "Apollo to the Moon" gallery at the National Air and Space Museum has provided millions of visitors a close-up look at some of the key artifacts from humanity's first visit to another world. On Monday (Dec. 3), the gallery will close forever. The exhibition's closure is one of the first major moves in the $1 billion renovation of the museum. The revitalization of the building's exterior and infrastructure, as well as the transformation of all 23 galleries and presentation spaces is expected to take seven years to complete. Throughout the renovation, the Smithsonian plans to keep the museum open with phased gallery closures. "Apollo to the Moon" and another hall, "Looking at Earth," will be the first to close on Monday, with another seven of the exhibit halls to follow in January. One full wall inside the "Apollo to the Moon" gallery at the Smithsonian’s National Air and Space Museum in Washington, DC was dedicated to displaying astronaut tools and equipment used on NASA's early spaceflights. Upon entering "Apollo to the Moon," visitors found themselves standing before the colossal business end of the massive rocket that launched astronauts to the moon — or so it appeared. "One of our key artifacts in this gallery was the F-1 rocket engine," said Neufeld, standing before the display. "Actually, it is one and a quarter rocket engines, with mirrors on both sides. If you looked into these mirrors, you could see there are five engines on the bottom of a Saturn V."
A single F-1 engine measures 18.5 feet long, 12.2 feet wide (5.6 by 3.7 meters) and weighs in at 18,500 pounds (8,400 kilograms). The optical illusion allowed for the sight of five of the engines that would have otherwise been impossible for the second floor gallery. "It was a very clever display, which we are going to reuse in the future," Neufeld said. Two glassed-in displays in the Smithsonian National Air and Space Museum’s "Apollo to the Moon" gallery once exhibited the spacesuits worn by Neil Armstrong, Buzz Aldrin and Gene Cernan while on the lunar surface. Walking further into the room, the public saw a mockup of an Apollo lunar module cockpit and a wall lined with astronaut equipment that spanned the history of the first U.S. spaceflight in 1961 through the last of the moon landings in 1972. Also on display here was a control panel and power-generating fuel cell from an Apollo command module, as well as the backup unit to the first astronomical observatory to be deployed on the moon. Already removed from "Apollo to the Moon" but present in the gallery for decades were the spacesuits that astronauts Neil Armstrong, Buzz Aldrin and Gene Cernan wore on first and the last missions to land humans on the lunar surface. Cernan's suit was displayed next to a test version of the lunar roving vehicle he drove while on the moon. "They actually had a kind of dune buggy, a rover that the astronauts could drive around that gave them much more range," described Neufeld. In total, "Apollo to the Moon" showcased more than 200 artifacts, including the Skylab 4 command module, which was suspended above visitors heads as they left the gallery. The hall's exit also offered an exhibit of several moon rocks and lunar dust samples. Artist’s rendering of the new "Destination Moon" gallery replacing "Apollo to the Moon” at the Smithsonian’s National Air and Space Museum in Washington, DC in 2022. To protect the artifacts during the renovation, most will be moved to a collections storage facility at the Air and Space Museum's Steven F. Udvar-Hazy Center in Chantilly, Virginia. And although "Apollo to the Moon" won't be available, visitors to the National Mall building will still be able to see items from the moon landing program. "We have other things here that you'll be able to see about Apollo. We have a lunar module in the main hall and it is going to stay there, open, until 2022," said Neufeld. "We will have Neil Armstrong's spacesuit opening [on display] in July 2019 for the 50th anniversary of Apollo 11. And we're going to have a special case of Apollo 11 astronaut artifacts in 2019." Meanwhile, "Apollo to the Moon" is being replaced by "Destination Moon," a new gallery that will display many of the prior exhibition's artifacts while also expanding the focus of the hall. "It is like ['Apollo to the Moon'] in the sense it covers the whole moon program, but it is going to be bigger," Neufeld explained. "It is going to cover all of history, from ancient dreams of going to the moon all the way up to the moon missions that are going on now." "This new gallery will give the whole sweep of lunar exploration, with going to the moon in the 1960s as the core story," he said. The new "Destination Moon" gallery is scheduled to debut to the public in 2022. Take a photographic tour of the National Air and Space Museum's "Apollo to the Moon" gallery at collectSPACE.